It could be a club, or organization, of sorts. The I-hate-it-when-I-make-HUGE-mistakes-at-something-I’m-good-at club. Can anyone else join? Or at least stick their head in to see what all the fuss is about? With humbled conviction, I can say there are four things in life that I’m really good at: cooking, teaching, writing, and yoga. I guess we could bump it up to five things if eating is an area in which to excel. Or maybe even six if driving too fast is considered, but for arguments sake, let’s keep it at four. So when I completely, utterly, remarkably destroyed a pie on the 4th of July, I went down the list of excuses. North Florida backwoods fireworks boomed with each doleful attempt at an excuse. Then, right as Rob came over to give me a supportive hug, inevitable frustration took over. “What the hell! What the hell was I thinking? !” I hissed at him (because he was near). Rob’s arms quickly – and understandably – released as mine over-exaggeratedly flew around, and my mom graciously admitted that she wasn’t that hungry anyway, and my dad echoed the sentiment. Our progressive summer holiday dinner, where our house was the dessert stop, literally stopped. This has happened before. Where I mess something up in the kitchen, and have to swallow verbal shrapnel for fear others in the vicinity will call the nutty-farm to pick me up over a failed pork roast. Or from-scratch citrus butter. Or seared scallops. Or fig pizza. But the best thing about these mess ups, is that I get to try again having always learned something. That did sound a little afterschool special-ish; however, it’s true. With the scallops, for instance, don’t put a hard-plastic handled pan on a grill. It may just break completely off sending scallops flying all over the porch (sorry, Mom). And with the citrus butter, adding too much citrus breaks the clotted cream. Add a bit of salt and sugar instead. With the figs, well, just don’t add them to a pizza, and never ever yell into the oven at a pork roast because it won’t cook fast enough. Lesson learned: the pork will ignore you, and you’ll look like a raging moron. Well, this latest mistake was a dessert mistake. I’m not particularly a sweet-toothed person, most of which I attribute to the fact that my mom couldn’t let go of the chimichangas while pregnant with me. Though in the summertime, I love, love, love Smores. So what better perfect summertime pie than a Smores Pie? I planned the layers of the pie perfectly: graham cracker crust, then milk chocolate custard (in true Smores Hershey style), melted marshmallow, and then a meringue topping torched to resemble the most perfect, campfire-toasted mallow. 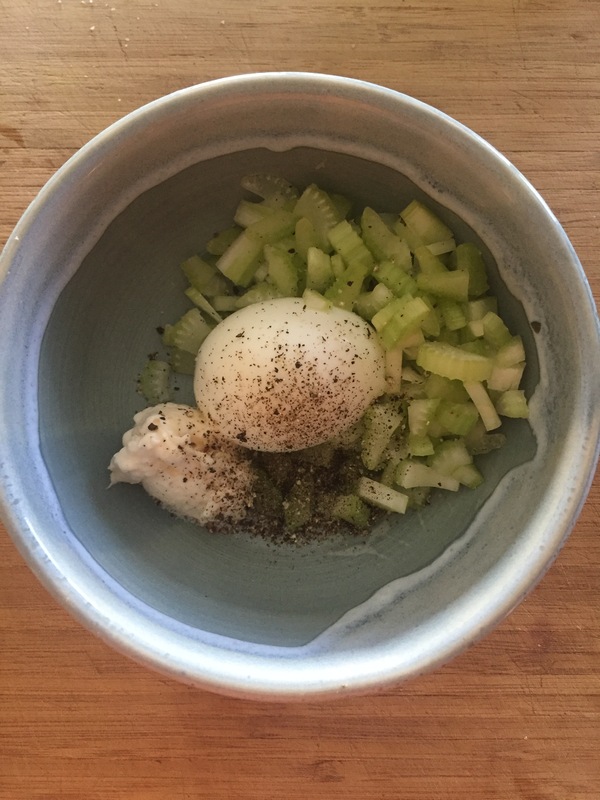 Here was the problem: the custard needed to be baked at a certain temperature (preferably in a water bath), and the meringue needed to be baked at a different certain temperature to ensure the egg whites get fully cooked, yet still set to a fluffy, airy, topping. Here’s what went wrong: I double baked the custard in order to cook the meringue, which completely separated both the melted marshmallow and the custard, resulting in a soupy, gloppy, broken, slimy, inedible mess. Really. Not edible. Not exaggerating. After the flailing arms breakdown, the 4th of July came and went, and the 5th of July was upon us with friends coming for dinner and to watch the Women’s World Cup Championship. So rather than wallow in kitchen disaster pity (like I am honestly still doing with the pork roast – seriously folks, it hasn’t been attempted since), I decided to try the pie again. The deep breaths in the kitchen were audible. I reviewed: graham crust? Fine. Custard? Creamy and light. Melted mallows? Genius. Problem: Bleeping meringue. Solution: make a thick whipped topping instead. To get the toasted campfire flavor, cook the graham crust just a bit longer locking in some carbon flavor. Result? Pie perfection. 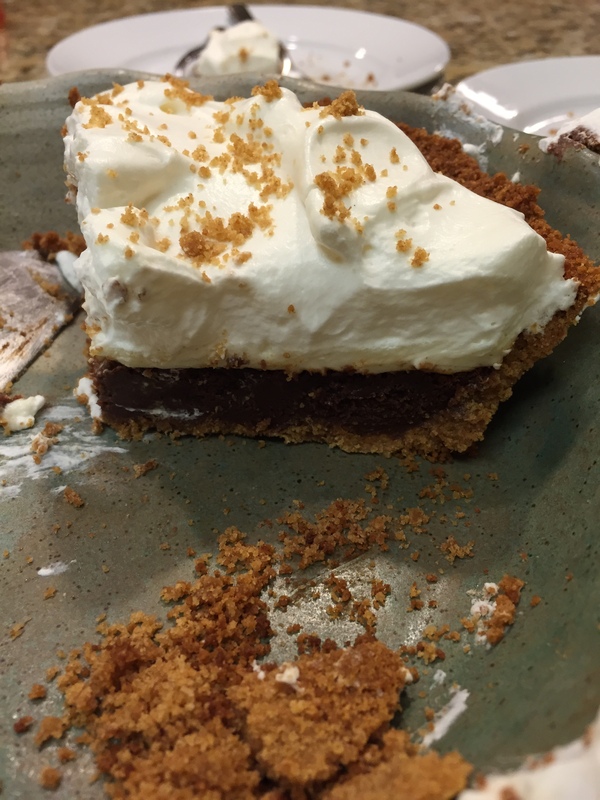 Our guests loved the pie, Rob loved the pie, I loved the pie – it was smores-y, creamy, dreamy, and everything summertime sweets should taste like. But, mostly I loved it because I had tried again and succeeded after an epic, epic fail. Lesson learned: try again. It should be a kitchen motto, really. Even with food that turns out fantastic. Try again. It will be great again, or maybe even better! So with that, I’m sending summertime love and a sweet, sweet, do-over Smores Pie! Using a food processor, crush up the graham crackers with 6 tbsp of butter, and ¼ tsp of Kosher salt. When finely ground, pour the grahams into a pie dish, reserving ¼ c of the grahams for topping at the end. Using hands or the bottom of a measuring cup, firmly press the grahams evenly across the pie pan, and up the sides. Bake for 7-10 minutes. To make the chocolate custard, pour the chocolate into the top of a double boiler (or use a glass dish over a pot of boiling water. NOTE: do not let the water touch the bowl, or it will burn and separate the chocolate). Heat up the ½ c of heavy cream for 30 seconds in a microwave, or over the stove. Pour the heavy cream over the chocolate and stir. While the chocolate is starting to warm, using a hand mixer, beat 3 egg yolks with 1 tbsp of sugar and 1 tsp of vanilla extract. Vigorously beat the egg yolks until they are fluffy, pale yellow, and form a smooth falling ribbon when falling off the beaters. Once the chocolate has started to melt, mix it together quickly until smooth. Remove the top bowl from the heat, and place on the counter. 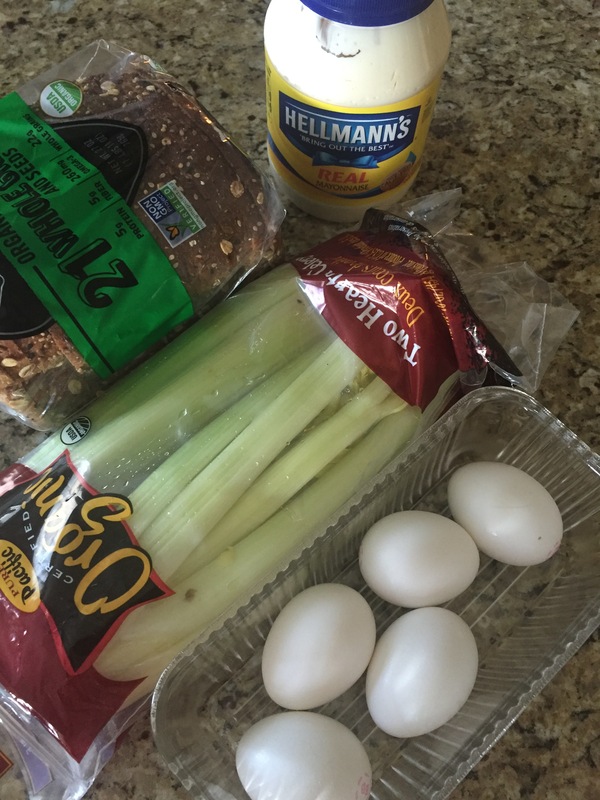 At this point, the eggs need to be tempered (if you immediately add room temperature eggs to the hot melted chocolate, you will curdle the eggs – yuck). While vigorously whisking the eggs with one hand, use the other hand to slowly ladle a stream of the melted chocolate into the eggs. Do this with 2-3 spoonfuls, or until the bowl with eggs feels warm (and may steam). Then, while continuing to whisk the chocolate, pour the egg mixture back into the bowl of melted chocolate, and completely combine. At this point, add the sea salt and the cayenne pepper to the chocolate, and mix thoroughly (it may sound strange, but the salt and hot pepper add a dimension to milk chocolate that is lacking on its own – it makes the flavor more rounded, while keeping the integrity of the milk chocolate smores taste). Pour the custard into the pie pan and place the pie pan on a sheet tray. Place the tray in the oven, and carefully pour the hot water left over from the double-boiler, onto the sheet tray making sure no water gets into the pie (this is called a bain marie and the hot water steams to help cook the custard evenly). Bake the custard for 35-40 minutes, until firm, yet still a little jiggly in the middle. After the custard has baked, remove it from the bain marie and let it cool to room temperature. Once cooled, start to make the gooey marshmallow layer by putting the marshmallows in a microwaveable bowl with the 2 remaining tbsp of butter. Heat the marshmallows in the microwave for about 20 seconds, or until the marshmallows just start to expand. Quickly remove the bowl from the microwave and stir the mixture until the butter and melted marshmallows combine to make one mixture. While still warm and pourable, evenly pour the marshmallows over the custard. Put in the fridge to set for anywhere from 1 hour to overnight. Just before serving, whip the 2 c of heavy whipping cream using a hand, or stand mixer. When just starting to get bubbly, add the vanilla extract and the confectioners sugar. Whip the cream until stiff peaks form. 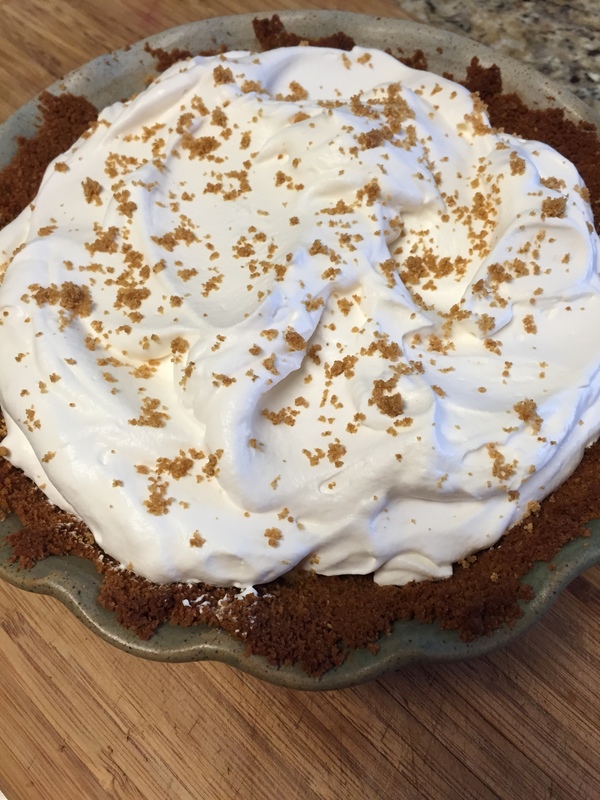 Dollop the whipped cream on top of the pie, making a fluffy design, and sprinkle the remaining graham cracker crumbs on top. It’s no question that Mr. Fred Rogers was an icon for children. For that matter, he was probably an icon for many adults, too. And it’s a strange wonder to think about what Mr. Rogers would post if he were a part of today’s technology addicted world. Would Mr. Rogers “like” things? Would he “retweet?” What would be Mr. Roger’s answer to cyber bullying? If only we could ask him. Despite the fact that I used to do web design for a Fortune 500 company (this was many moons ago, folks; we’re talking Front Page fun), I am what many would call, “Old School” when it comes to modern day technology. Facebook was purposefully not on my radar. Twitter, Instagram? Hardly! Once, I had a Bluetooth. That lasted about 5 ½ days. My husband, on the other hand, is very technologically sound and has been able to hook up our HDish-something television to Netflicks, and connect Pandora through our internal and external house speakers, all through his phone. It’s a quiet house when he deploys, for sure. When I was little, my mom would let me watch certain shows on TV, Mr. Roger’s Neighborhood being one of them. She recalls how I would giggle and shy-up when Mr. Rogers asked, “Would you like to be my neighbor?” like he was talking to only me through that electronic box. I was infatuated with the guy; his quiet nature, slow talking cadence, and always-caring demeanor naturally drew me in, as it still does today. Now, after teaching for 10 years, and seeing such a drastic change – not only in education, but generally in kids these days – there’s a need for Mr. Rogers and his wisdom. Last Friday, it was rainy, cold, and all around dreary. The kids were, what teachers would say, “Done.” Being one that does not normally turn on the tube in class, I surprised my students with a streaming episode of Mr. Rogers Neighborhood. With just the first few jingly notes of his intro, the kids were hooked. When he asked, “Will you be my neighbor?” Almost every student in the class responded in a quiet, genuine, “Yes.” When he slowly yet deliberately asked, “Are you growing up?” Again the class, mesmerized, responded. Just like when I was young, my 5-year old students thought Mr. Rogers was talking to them personally. So that got me wondering. Stepping out of the wonderfully simple, old, syndicated television world into a comparatively loud and crazy one, what would Mr. Rogers do with today’s technology? What would Mr. Rogers tweet? Which of his Instagram pictures would get “likes?” How many Facebook “friends” would he have? I know I would certainly “follow” Mr. Rogers, but would he “follow” me? Share with care, like what’s nice, and always tweet upbeat. 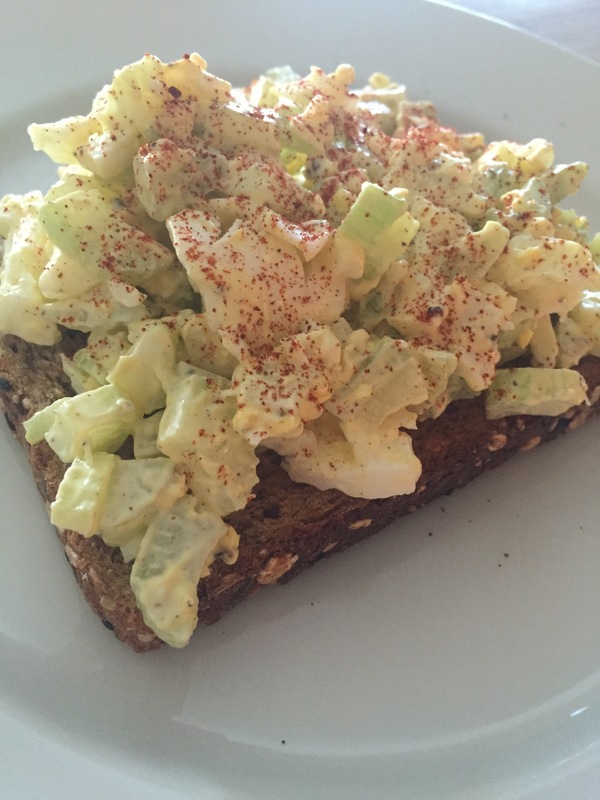 On these sites, you’ll find all cheerful, cheeky, fun, inspiring (if you like to cook), *mostly* healthy pictures, recipes, and personal anecdotes of, and related to, food. Please visit, please comment, and I hope you, as always, enjoy. 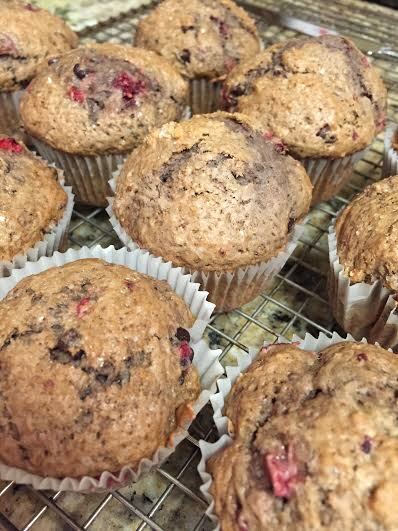 Chocolate Strawberry Muffins! These were a hit at our latest work potluck. They are super simple (and quick) to make, have all the comfort of a muffin, and the indulgence of a chocolate dipped strawberry. Disclaimer: Strawberries are currently in season here in Florida (weird, I know), so I completely understand that this recipe would be better suited for May-July in most parts of the U.S. But, hey – something to look forward to! For the dry ingredients, whisk 1¾ c all purpose flour, 1 tsp baking powder, 1 tsp baking soda, ¼ tsp cinnamon, and ¼ salt until combined. For the wet ingredients, cream 6 tbsp room temp butter with ¾ c brown sugar, and then add 1 room temp egg and 1 tsp vanilla extract. Also add 1 pint of hulled strawberries that have been smushed, smashed, crushed, and almost liquefied – but not liquified – by a fork. When mixed, add the dry ingredients to the wet in 3 batches. Fold in ½ c mini bittersweet chocolate chips until combined. 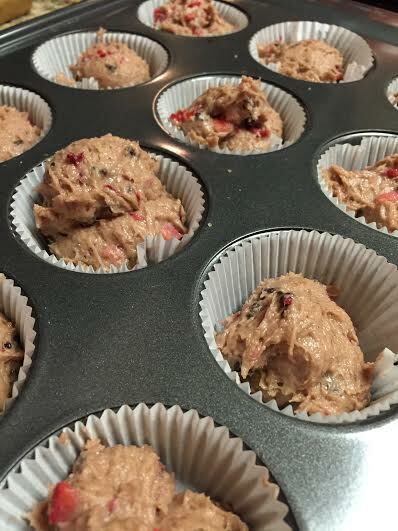 Then scoop into a cupcake-lined muffin tin. Sprinkle the tops with raw sugar and a tiny pinch of sea salt. Bake at 350 for 15-20 minutes until browned and an inserted toothpick comes out clean.